The plant’s ability to rapidly colonise waste ground, in particular places devastated by fire or bombing, led to its being called ‘fireweed’ or ‘bombweed’ during the World Wars, and it was soon seen as a nuisance rather than an attractive border plant. This is a shame, I think, because the flowers are lovely, and they are also a late source of nectar for bees and other insects. These pictures were taken a couple of weeks ago around Loch Leven, when the bright pink blooms made a lively display against yellow ragwort and brilliant red rowan berries. By contrast, the seeds (right) were photographed a few years ago, at Killiecrankie – a different atmosphere entirely, with the chill of winter already settling into the dark woods there. In the stillness of that place, the seed heads seemed like the ghosts of a summer long gone. 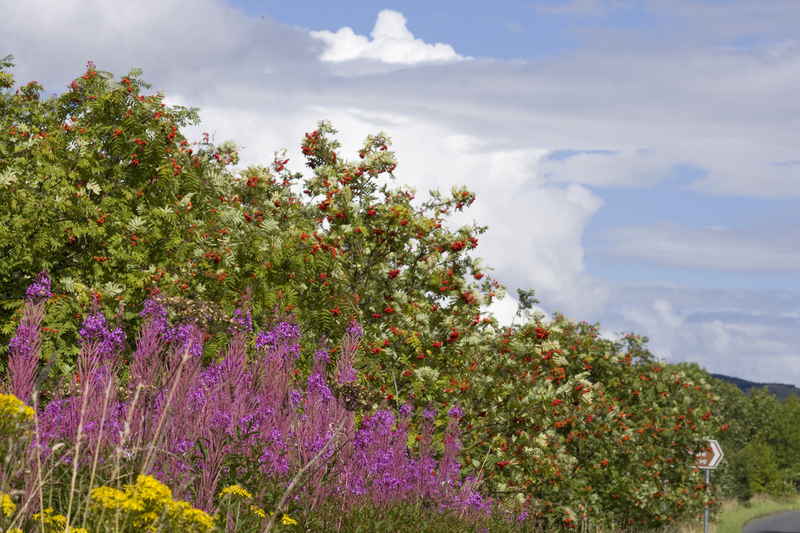 There’s not a lot of folklore about rosebay willowherb – perhaps it hasn’t been around as a wild flower for long enough – but it’s interesting to read of a superstition that warns against picking them, or a thunderstorm will ensue. I’m guessing this was a fairly safe bet, as late summer heat often leads to a thundery downpour. Or at least it used to… this year seems to be re-painting our visions of summer in shades of watery grey, and there are already some splashes of gold among the trees. Will we have a mellow start to autumn, or are we going to slide straight into winter? I’m all in favour of leaving wild flowers alone and letting nature find its own balance. It’s lovely to see so much rosebay willowherb this year, and I hope that the bees are enjoying them. Very beautiful flower. We have it but not here where we live. It seems it enjoys more our mountains than our plains. I am wondering if it has any scent? Here on the west coast of Canada, we know the “Fireweed” as an early colonizer of Burnt over and logged off lands. To see a clearcut mountainside glowing with a brilliant pink purple blanket certainly beats looking at the grey of the ‘slash’ the loggers leave. Rosebay willowherb or fireweed is a natural part of the cycle in the life of the forest, and fireweed honey is delicious. Many beekeepers locally put their hives out in the slash areas (fenced and protected from bears–as well as possible) to take advantage of all the lovely nectar. I recently learned that Fireweed can also be used to make fibre, much as Nettle and Flax are . This plant is totally knew to me so thanks for the introduction. It is a very lovely flower. That is an incredibly vibrant pink. I forget sometimes how much farther north you are. Our summer will not slack off for til later in September. I’m ready for some cooler weather. I’m glad you enjoyed it, Pat – yes, they are such a vibrant pink, so eye-catching. The flowers progress right up the stem like sparklers and finish at the top with the final buds. I do feel as if we’re in the far north at the moment – summer has a bit of a cool edge now, in fact we never had much heat really! I hope your cool weather arrives soon. Beautiful photos, Jo. We call it RBWH in my family, and I love seeing it by the roadside. I suspect I think this every year, but it seems to be especially abundant this year. It does look very ghostly in that winter shot and I, for one, am hoping for a mellow autumn (and winter) but with just enough crispness to produce some magnificently coloured leaves. Those are beautiful flowers! They must be the same species (or at least very close) as the Chamaenerion angustifolium that we have here and call, simply “Fireweed”. Yes, they are the same species – that’s the same Latin name we have for them here. I love seeing them, and they’re cheering up our dull grey days at the moment! Such a lovely flower. This summer, I saw many of these plants in eastern Maine, USA and also all the way over on the Pacific coast in British Columbia and northern Washington state. It’s amazing how broad its native range is. Lovely to hear that it’s widespread in the US and Canada. Apparently it’s spread around the northern hemisphere, so a very ambitious plant considering that it was once a prized garden species! In the States I have run across 2 species, though we use the Latin name Epilobium. I got my seeds for fireweed from a medicinal seed company in Oregon (they also carry an smaller species, small-flowered willow herb): https://strictlymedicinalseeds.com/product/fireweed-epilobium-angustifolium-packet-of-300-seeds/ . It grows well for me here in Ithaca NY. It actually has important medicinal value, as does the smaller species, for prostate and urinary tract problems, so we should value this plant and make sure we keep it in our gardens. That’s very interesting – thanks for sharing that! I am glad to know that you can buy the seeds and that they grow well for you. The more we learn (or re-learn) about nature, the more we benefit, it seems! It was well-timed in that case, Lynne! 🙂 Loads of it around here too, so nice to have such a late-flowering wayside flower.